Driving along the A65 from Ilkley then the B6160, I could see the beautiful landscapes of Wharfedale one after another. I agree completely with the opinion that Wharfedale is the most beautiful dale in the dales. 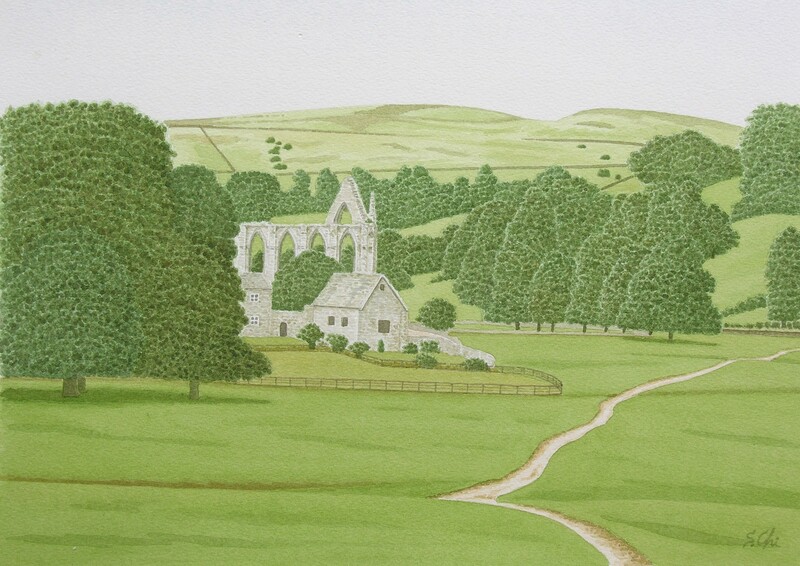 On the bank of the River Wharfe, about 5 miles to the north of Ilkley, the small ruins of Bolton Abbey lie. Losing stained glasses, the vacant large window of the roofless presbytery is gaping open. And in the east of it, the River Wharfe flows gently like days when the monastery was flourishing, looking sfter the ruins. The times seems to be stopping here. The abbey was founded by Augustinians in 1151 or 1154(the date differs in various souces ) and most parts were completed in about 1220. But the church had been repaired and extended by the Cliffords who succeeded the lordship of Skipton in 1310 and it also became the partronage of Bolton. After the dissolution of the abbey in 1539, the monastic estates were passed into the hands of several owners. Henry Clifford, 1st Earl of Cumberland owned the estates in 1542, and now they are a part of the Dukedom of Devonshire. 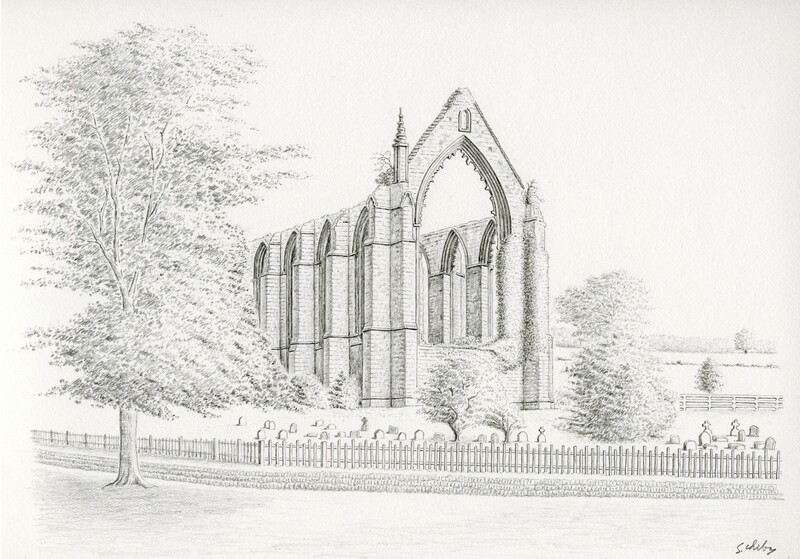 The nave of the ruins was repaired in 1864 and has been used as the parish church 0f Bolton Abbey. Bolton Abbey was a priory actually, a small monastery, and never achieved the status of abbey, but the local people have been calling it "abbey" with the pride of their town. By the way, there is a story when the abbey was founded here. The Wharfe, its width is several dozen yards, flows calmly here. But at the about 2 miles upper from the abbey, the river suddenly compressed into about 4 feet like a channel. It seems very easy to stride over it. Hence　it has been called "the Strid", but the depth of the stream　is more than 30 feet and it flows swirlingly and violently and the wet rocks of the riverside are slippery. Therefore the Strid has claimed many challengers' lives. William, the sole heir of Alice de Romilly, the then Lord of Skipton, came upon the Strid with his greyhound and tried to leap across. As the frightened dog stepped back on the brink, William was pulled back and fell into the stream and was drowned. The tale says that his mother Alice mourned her son's death and built a priory as a memory of her son, which she and her husband had founded at first at Embsay, near Skipton. On the other hand, there were records that proved the boy was alive. That shows the tale was not true. I suppose the tale had been made from the fact that there were mothers who lost their sons at the Strid in the past. Even if you are brave enough to stride the atream, you should not do. It is said whenever the Strid claims a victim, "the White Horse of Wharfedale" rises from the water. Who would like to confirm the tale? David Cox painted the ruins in the twilight in the 1840s and Thomas Girtin painted the river near here in 1801 in watercolours. I was much satisfied that I was able to stand there and examine the places in the landscapes painted by them.